I say this extremely tentative but life hasn’t been bad lately. It’s made for a very welcome change. My Mum and I went to London for a couple of days in June which was great. Quite refreshing even if it was very busy (we were only there for a Sunday afternoon/evening and Monday morning/afternoon before heading off to visit my ‘Grandad‘ so we packed a lot into the limited time). Since then, things have been quite steady. Samsung 40″ full HD TV. 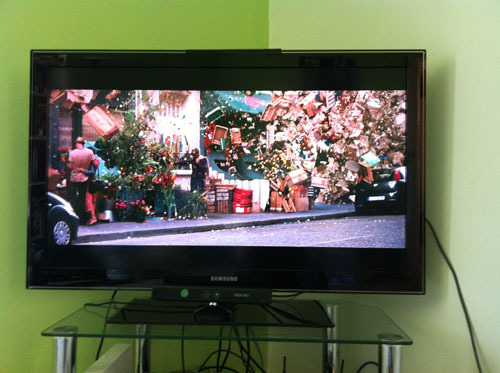 It’s quite a step up from my old TV, a Samsung 32″ 720P TV. It’s also meant that I’ve moved the TV stand, giving me more room for Kinect based games. On that note, I’ve started to concentrate on getting fit. This week, I’ve started using EA Sports Active 2 on a regular basis in the hope it gives me a good workout. As well as that, I’ve regularly been using an exercise bike. I’ve definitely noticed a difference and I’m up to 15km in 40 minutes which is pretty good I’d say (I have nothing to base it on!). 16km is my next goal as that works out at 10 miles which sounds good to me. If nothing else, it’s making me feel good about my efforts. Gaming wise, my pile of shame has grown thanks to having a bit more money and an urge to treat myself. I’ve now got Metro 2033 and Dungeon Siege III to play, as well as review copies of Transformers: Dark of the Moon and Williams Pinball Classics. I’m now doing some review writing for Xboxer360.com who are a lovely bunch of people! Transformers: Dark of the Moon is for TheSixthAxis, always a fantastic group of writers. Work wise, 148apps work is flowing very steadily and I’ve finally got round to pitching places. Well, ok, one place. For a nervous wreck, I’d say that’s quite a step. More hopeful emails to be sent next week! I’m expecting abject failure but I’m also hoping if I try enough places, someone will foolishly say yes to one of my feature ideas. Anyway, that’s all ending on a bit of a negative note which isn’t the point. Life’s going OK. Hope it continues! Hope you have some fun Kinect times now you have more space, are you going to get any other fitness games, like Zumba or UFC Trainer? I’ve tried UFC Personal Trainer and it nearly killed me 😉 So I’ll give that a miss! Heard of far too many problems with it too, forgetting progress etc. Not the slightest bit of interest in Zumba as I can’t stand all that dancing fitness stuff! Might go back to The Biggest Loser or Your Shape sometime though.